When it is time to upgrade to a more spacious SUV you need it to have flexible seating that provides versatile cargo and passenger space as well as an efficient engine under the hood. 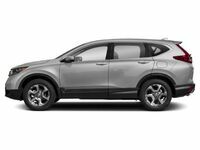 The 2019 Honda CR-V is a sporty and stylish SUV that has two powerful and fuel-efficient engines to choose from as well as a split-folding rear seat for optimal cargo and passenger convenience. 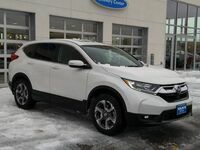 Get to know the impressive performance specs and the interior features and capacities of the 2019 Honda CR-V below and you can climb into the cockpit of the 2019 CR-V today at Van’s Honda in Green Bay, WI. What are the Performance Specs & Interior Features of the 2019 Honda CR-V? The 2019 Honda CR-V is offered in four trim levels, the LX, EX, EX-L, and Touring. 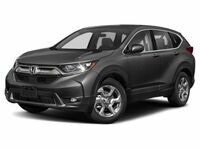 The standard engine of the 2019 Honda CR-V LX trim level is a 2.4L In-Line 4-Cylinder that supplies it with 184 horsepower, 180 lb-ft of torque, and a 1,500-pound maximum tow rating. Under the hood of the EX, EX-L, and Touring trim levels is a 1.5L Turbocharged In-Line 4-Cylinder engine that arms the 2019 CR-V with 190 horsepower, 179 lb-ft of torque, and also a 1,500-pound towing capacity. Both engine options pair with a Continuously Variable Transmission with Sport Mode for optimal fuel economy and Real-Time All-Wheel Drive with an Intelligent Control System is available for all trim levels for confident driving over any terrain. The cabin of the 2019 Honda CR-V has spacious seating for five people and the LX trim level provides them with 105.9 cubic feet of total passenger volume while the EX and EX-L trims provide 102.9 cubic feet of passenger space and the Touring trim has 101.6 cubic feet. Behind the 2nd-row seat of the 2019 Honda CR-V there is 39.2 cubic feet of cargo space and with the 2nd-row seat folded flat the CR-V can hold up to 75.8 cubic feet of cargo. All five passengers will appreciate the standard 5” color touchscreen display with a 4-speaker stereo and a Bluetooth® connectivity. The 2019 Honda CR-V EX, EX-L, and Touring trim levels receive a 7” high-resolution touchscreen display, Apple CarPlay™, Android Auto™, and HondaLink® for an even more encompassing infotainment experience. The three upper trims also get equipped with standard heated front seats and a power-adjusting driver’s seat and the EX-L and Touring trim levels add leather-trimmed seats. You can take the 2019 Honda CR-V for a test drive today at Van’s Honda in Green Bay to experience all of its exciting specs and features for yourself.